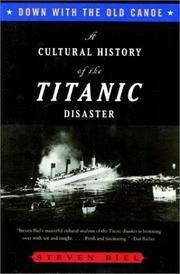 Home > Textbooks > Down with the Old Canoe: A Cultural History of the Titanic Disaster. Down with the Old Canoe: A Cultural History of the Titanic Disaster. New York, NY W. W. Norton & Company, 1997. Paperback First Edition Thus (1997); First Printing indicated by a complete numerical sequence. First Edition Thus (1997); First Printing indicated by a complete numerical sequence. Very Near Fine in Wraps: shows only the faintest shelf-soiling to the bottom edge of the text block; else flawless; the binding is square and secure; the text is clean. Free of creases. Free of any ownership names, dates, addresses, notations, inscriptions, stamps, plates, or labels. A handsome, like-new copy, showing only a single unobtrusive flaw. Bright and Clean. Virtually 'As New'. NOT a Remainder, Book-Club, or Ex-Library. 8vo. (8.25 x 5.25 x 0.8 inches). 300 pages. Language: English. Weight: 12.5 ounces. Trade Paperback. Title: Down with the Old Canoe: A Cultural History of the Titanic Disaster.